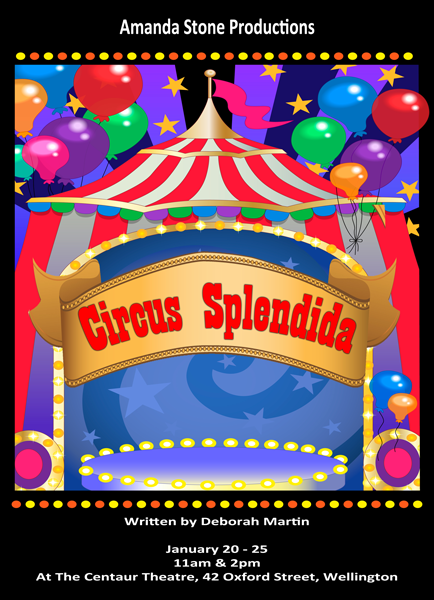 Written in the form of a concert, Circus Splendida is about two main characters, the circus ringmaster and his assistant Myra, who along with a quartet of clowns present this fantastic storyline as the background to the circus performances. The story of Circus Splendida consists of 13 great acts brought to life by 7 main actors and a number of smaller speaking roles. The size of the cast can vary greatly all the way from a large group of 70 - 80 to the entire school. The 13 performance items vary greatly in style and include songs, instrumental work, dances, creative movement and music backed chanting. As the show is circus themed some creative movements like gymnastics and tumbling can be incorporated to give more life to the performances. Props like hula hoops and balls would also make for good props during these performances. Each of the performance items vary in difficulty but there are items suited to most age groups and the show closes with a moving song performed by the entire cast. Staging the show only requires one set painted in bright, vibrant colours. One suggestion for a backdrop is a large smiling clown face at the centre adorned with the words 'Circus Splendia'. This show has also been written in such a way that it supports being performed on a traditional stage as well as an arrangement where the audience are seated in a circle around the stage area. Circus Splendida is a show filled with colour, humour, energy and a great story. It features clowns, jugglers, hula hoop performers, the tiny tumblers and lots more! It revolves around one night in the life of a circus troupe that is competing for the opportunity to go on a fantastic world tour. The circus ringmaster and his assistant Myra present the various performers who are vying to win this once in a lifetime opportunity. All of the various acts in the circus troupe try their best to present a fabulous performance but fall just short of the mark. To the surprise of everyone it's the bumbling quartet of clowns who emerge as the unlikely heroes of the show and along the way provide lots of laughter. No circus skills are required for this show, just tons of enthusiasm. Circus Splendida features 12 different performance groups accompanied by a small group of main characters. These characters can rehearse their parts separately and then begin to work with each of the performance groups later on in production. The actors who portray these characters will remain in the wings during the show since they will be called on regularly as they link each of the performance items together. The first of the main characters is Myra, the bossy and unpopular assistant to the ringmaster. Although she begins the show as unlikable, eventually the audience will sympathise with her and come to realise that there is a different side to her. The ringmaster himself is a very confident performer and acts in a very theatrical way. This role could allow the right actor to really make it their own. The most critical roles in the show are that of the 4 clowns. Circus Splendida is really their story and follows their emergence as heroes of the circus. The clowns should be played by performers who are terrific at comedic and mimed acting. As clowning around is quite physical they also need to comfortable with bumbling about on stage. There is also Benny, a cheerful supporting character who acts as the chief circus rigger. There are a number of different choruses in Circus Splendida: parade performers, riggers, band members, acrobats, tightrope walkers, super scooters, tiny tumblers, sculptors, a hula hoop chorus, the Lola chorus, jugglers and the clown chorus. Amongst these groups there are a number of small speaking roles for students.